Suspension, contrivance and The Power of Three (2012) | Randomwhoness: a Doctor Who blog by Johnny Spandrell. Sampling stories in random order. Years ago, I saw Speed (or as Homer Simpson calls it, The Bus That Couldn’t Slow Down) at the cinema. I remember that although I knew nothing about when I went in, I was soon captivated by this crazy, adrenalin ride of a film. The audience was engrossed in it too; I could sense that collective tension as Keanu and Sandy’s situation on that wretched bus got worse and worse, Dennis Hopper cackling wildly at them on the phone. At some stage mid-film, having survived all manner of exciting incident, our heroes divert the bus onto a freshly completed motorway. Except the motorway turns out not to be finished and the bus has to leap across the unbridged gap between sections of road. At that point, the spell was broken. The audience groaned in disbelief. The film had stayed on one side of plausibility up until then, but now it seemed ridiculous. I always remember that as an example of how much latitude an audience will give a story. Bomb on a bus? OK. Can’t go under 50 miles per hour? Sure thing. Bus jumps a gap in a motorway? Sorry, I’m out. I’m unwilling to suspend my disbelief any longer. There are a couple of moments like that in The Power of Three. 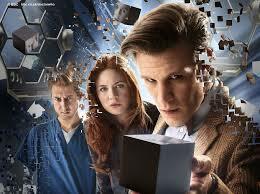 In it, as you’ll recall, the Doctor (Matt Smith, all arms and hair) has come to stay with comPondians Amy (Karen Gillan), Rory (Arthur Darvill) and Rory’s father Brian (Mark Williams, representing fatherhood again) as the world is invaded by mysterious black cubes. For a long time the cubes are benign, but one day they suddenly they spring to life and start attacking people. It’s action stations. Rory being a nurse, gets called into work at the hospital. RORY: I have to get to work. They need all the help they can get. BRIAN: Let me come, help out. RORY: Take your dad to work night, brilliant! No, not brilliant. Ridiculous. Why on earth would Rory take his Dad to work with him? They suddenly let unqualified volunteers assist at hospitals, do they? Especially during emergencies? The most irritating thing about it is how easy it is to write around. Brian could easily have been mildly injured by one of the cubes, hence making it logical that he should go to the hospital with Rory. Simple. It turns out the person behind the motiveless kidnappings and the deployment of the cubes is a space baddy called the Shakri. The Shakri (a criminally underused Steven Berkoff) has seven portals placed around the globe. And one of them, it turns out, is conveniently nearby. In fact, it’s at the hospital where Rory works. What luck! Only seven in the world, and one of them is in London. In fact, in the very spot where two of our friends are. What are the chances? Perhaps it was one of these happy coincidences which broke The Power of Three‘s spell on you. If not, perhaps it was one of the other credulity straining moments. Was it when Brian sat in the TARDIS for four days seemingly without food, water or sleep? Was it when the creepy little droid girl was still in the hospital months after we first saw her, in the same clothes, and no one had noticed? Or perhaps it was when one of the alien cubes was shown to be playing ‘the birdie dance’ over and over. Or maybe none of these things bothered you. Because let’s face it – we’re talking about a show about a regenerating alien in human form who travels through space and time in a ship disguised as a police box. Any claim to realism went out the door the moment Ian and Barbara burst through those big white roundelled doors back in 1963. Why should it bother anyone if the alien base is just around the corner or if Brian can watch a cube for the best part of a week? I don’t know why, but it does somehow. It’s that step too far. It’s that collective groan from the viewers of Speed. Time Lord? Right. Spaceship phone box? Fine. Birdie dance? Oh no, no, no, no, no. The Shakri’s plan, as it turns out, is to lull everyone on Earth into a state of complacency and then use the cubes to induce heart attacks, taking out a sizeable chunk of humanity. The Doctor has to think fast… But luckily there’s a magic switch to hand; he simply reverses the process and everyone lives. Again, it’s all a little convenient, but it’s fitting for a story which has had to contrive a way through its own plot. But to be a little kind to The Power of Three (and let’s face it, I haven’t been so far), I think the coincidences and conveniences which drive the plot are… well, if not deliberate then appropriate. If we concentrate on them, we’re missing the point. Because the heart of this story is not in your standard alien invasion plot; that’s just decoration. The real story is of the strong ties of friendship and what they can compel us to do. (Not for nothing does this story reference one of the Doctor’s oldest friends, the Brigadier. Ah look there’s fatherhood yet again). As the Ponds eventually find out, if you stick around with the Doctor too long, something bad’s going to happen. But of course that’s never stopped anyone hanging out with their friends, no matter how dangerous they are. That’s the real power right there. LINK to Night Terrors. They share the same TARDIS team sure, but they also both feature lifts as the gateways to other worlds. NEXT TIME… I know nothing about Vassy or the Catholics or half of what you talk about, but we’re having a stab at The Massacre of St Bartholemew’s Eve anyway.